On Thanksgiving, you get to take some time off work, relax with family and enjoy a delicious home-cooked meal, right? Well, not if you’re the one hosting. If that’s the case, your holiday is spent prepping, cooking, and cleaning. But it doesn’t have to be that way. Instead, book a Turkey Day reservation for the family at one of these restaurants in the city where they will do all the heavy lifting for you. 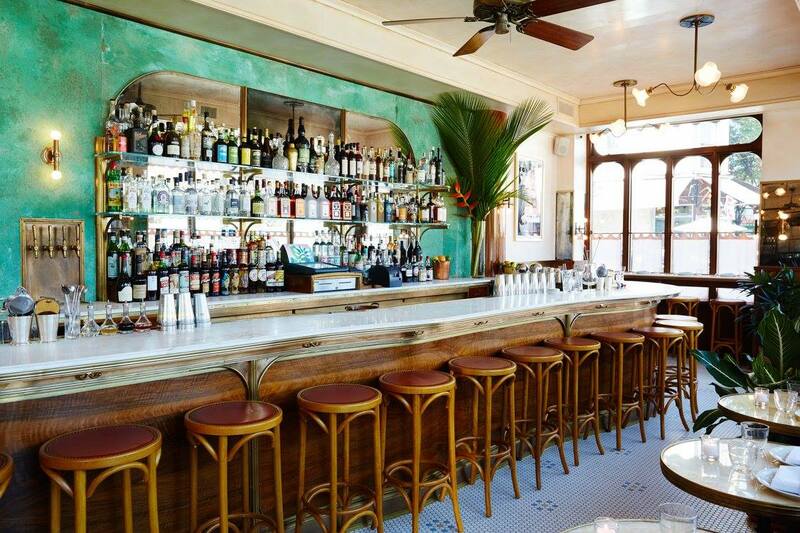 Here are seven eateries cooking up a Thanksgiving feast. The Southern Italian restaurant located in the Williamsburg-based hotel is serving up traditional Thanksgiving staples with a twist. The four-course prix-fixe menu will feature roasted organic turkey topped with a cranberry mostarda, smoked beets with pistachio and paired with a ricotta salata, and apple crostata topped with a pine nut gelato. You can choose between appetizers, main course and dessert for $95 per person and $40 for children 12 and under. Food will be served from 11:30 a.m. to 10 p.m., so you can tailor your meal to a time that works best for you. Just a fan of the sides or want to fill up entirely on turkey? 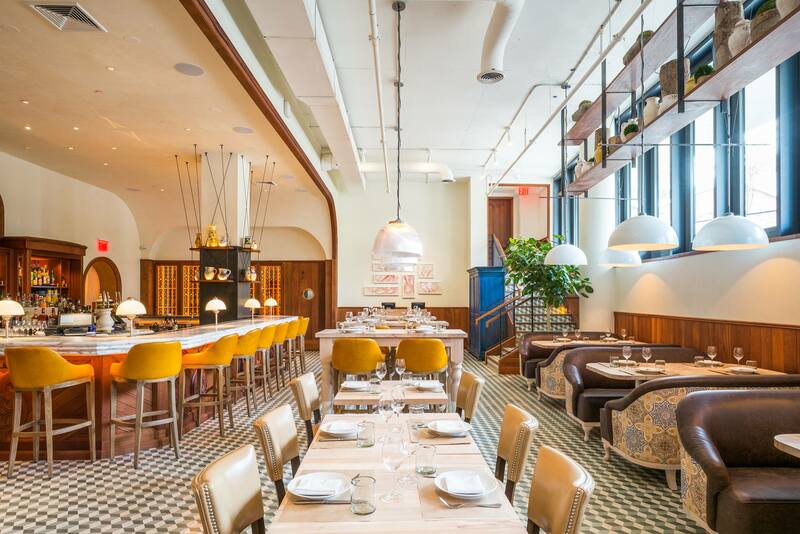 Head to new-American joint Ferris located in MADE Hotel in NoMad. There chef Greg Proechel—previously of Eleven Madison Park, Graffit and Le Turtle—will be whipping up Thanksgiving specials including braised and fried turkey leg, stuffing, cranberry kosho, green beans with garlic and crispy onions. The options allow everyone to order precisely what they want. Now that’s something to be thankful for. Usually, you’d end up at a Chinese restaurant if your Thanksgiving meal went awry. 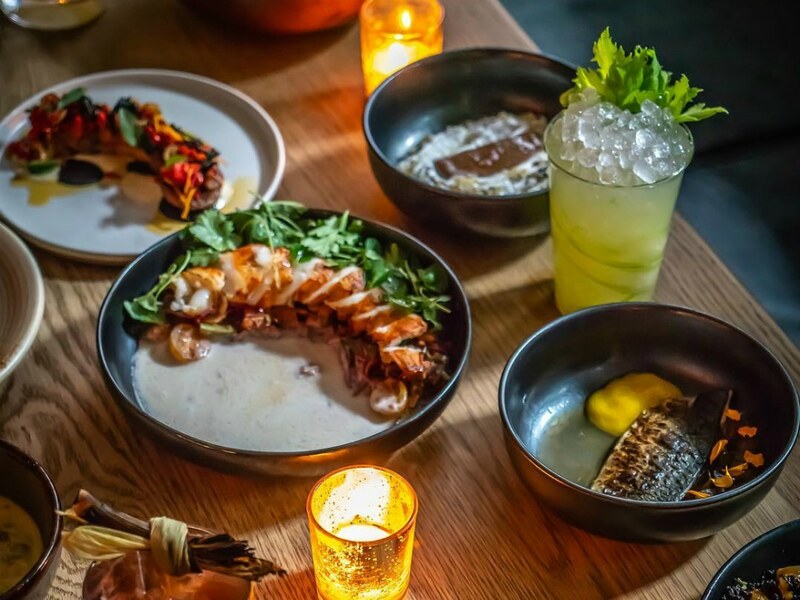 But you’ll purposely want to book a reservation at this Asian-inspired diner in SoHo after you hear the menu. They’re serving a four-course prix fixe feast for only $68 per person inspired by the surrounding Chinatown markets. First and second-course options feature unique seasonal ingredients and spices like curried kabocha squash, roasted vegetable umami broth, and tiger shrimp ceviche salad, in addition to more traditional dishes such as butternut squash ravioli. 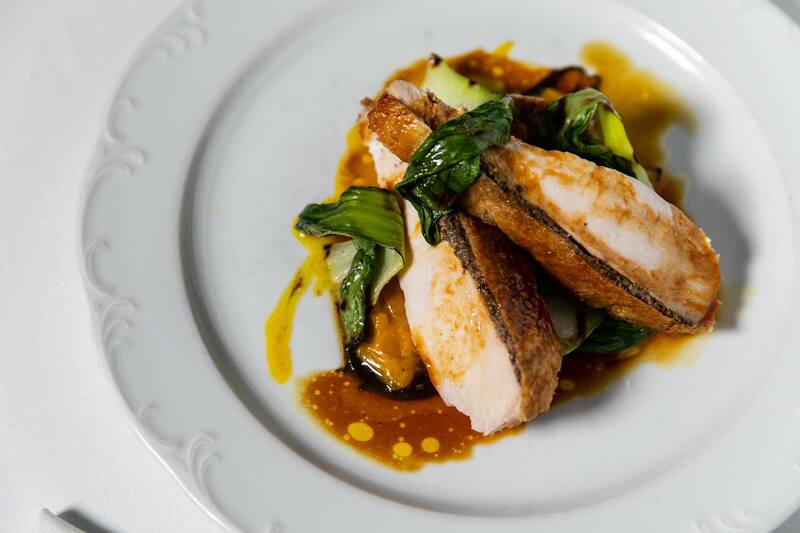 For your main course, choose between herb roasted turkey, truffle mushroom risotto, or crispy skin wild salmon. And for dessert, you’ll be treated to a traditional marshmallow pumpkin pie, and a molten chocolate lava cake served a la mode. Yum! Thanksgiving is all about family. So, why not have a family-style meal like you would at home? 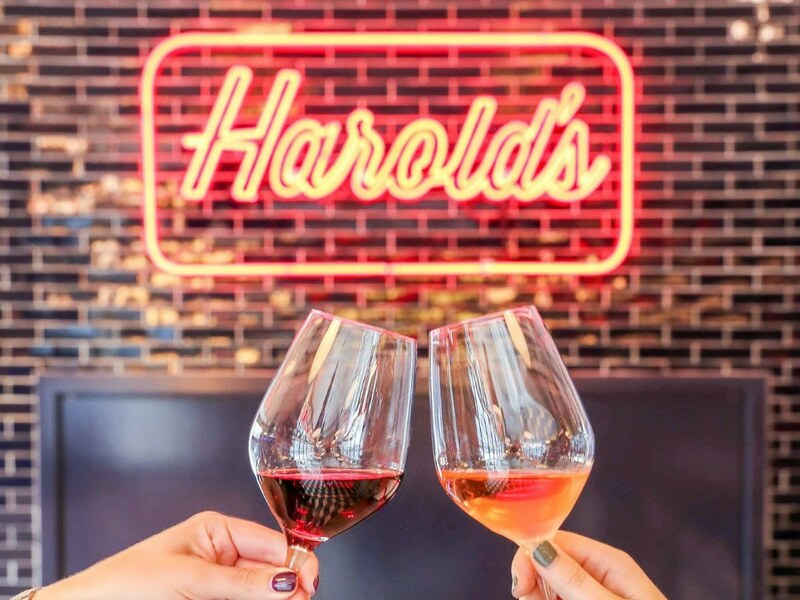 That’s what Harold’s located in the Arlo SoHo hotel is doing. 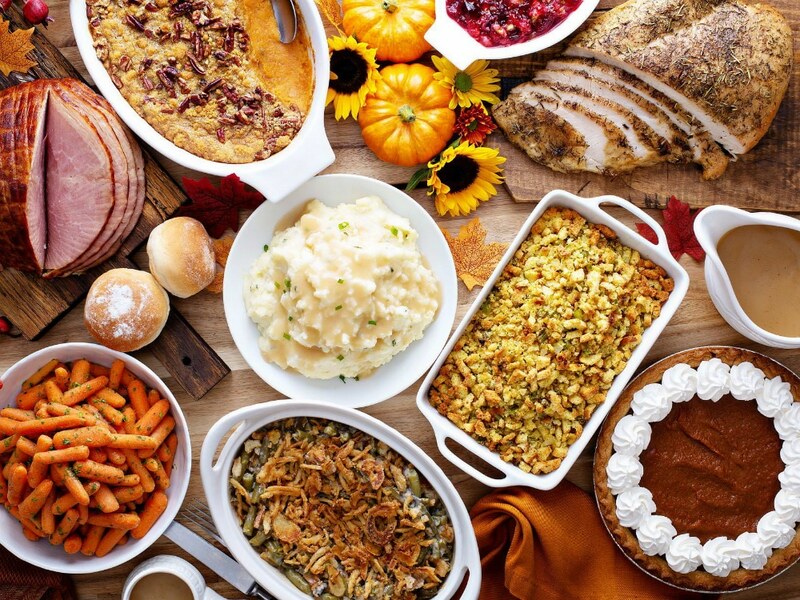 They’re offering a prix-fixe dinner menu for $62 per person with all the classic holiday comfort fare like roasted turkey, Italian sausage, ham steak, green bean casserole, mashed potatoes, stuffing, pumpkin, and pecan pies, as well as an apple cobbler and cranberry cheesecake. Even better, the courtyard has been transformed into an apple orchard with pick-your-own apples, hay bales, corn stalks, and pumpkins for sale. 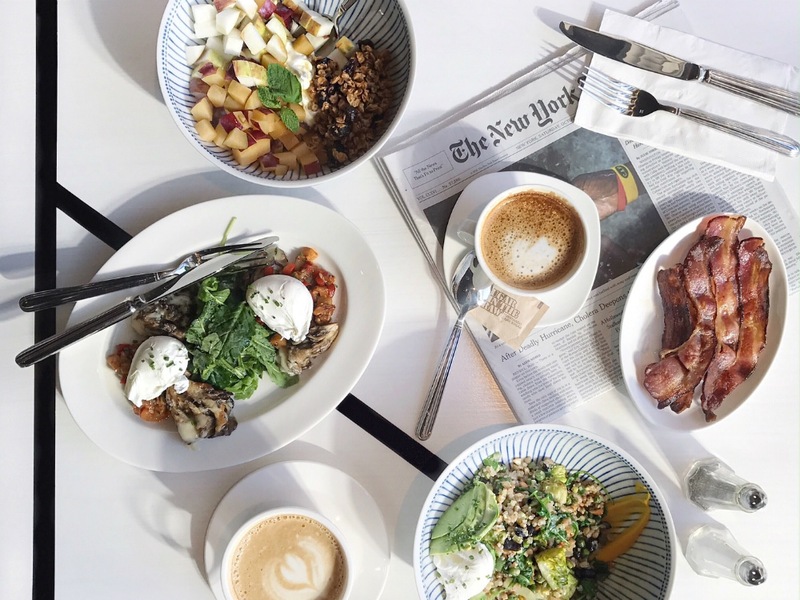 You’ll get stunning views of McCarren Park in Greenpoint while chowing down on a seafood-themed prix fixe dinner from the James Beard award-winning team behind Maison Premiere. For $68 per person, you can get acorn squash soup with Jonah crabmeat, crème fraîche and rye, pate de Campagne with pork, foie gras, and pickled mustard, and friseé and chicory salad with roasted pear, radish, and cheddar for the first course. The second course features brook trout, chestnut cavatelli, short rib creamed spinach, and, of course, turkey with Chestnut Stuffing, Cranberry, Gravy and Brussels. Dessert is a classic pumpkin pie and chocolate mousse. Don’t want to cook, but also don’t want to leave home? The famous Rainbow Room has you covered. Executive chef Mathew Woolf crafted a takeaway menu called “Rainbow Room In Your Home” featuring a full Thanksgiving Dinner for six for $325. You’ll get a perfectly cooked turkey and sides such as buttermilk potato purée, cornbread stuffing, Okinawan sweet potatoes, and spiced cranberry sauce. And he didn’t miss dessert; A seasonal choice of pecan, pumpkin or apple pie will top things off. If you think you’ll need more chow, there will also be an a la carte menu offering a selection of additional entrées, desserts, and sauces. Chef Galen Zamarra and chef Geoffrey Zakarian are debuting their new dinner menu collaboration just in time for the holidays. And for Thanksgiving, they’re whipping up an extra special treat for families. From noon to 8 p.m. you can get a prix-fixe meal ($95 per adult, $50 per child) that includes dishes like waygu beef carpaccio, trout piscator, traditional stuffing, sweet potato gratin, and roasted acorn squash. Dessert features classics like pecan pie and more modern fare such as dark chocolate pot de crème with wine poached prunes. They even have caramel apple cider doughnuts and sweet potato truffle pops as bonus treats.